I have lost track of the number of Leadership Challenge workshops I have captured graphically over the past six years. I am always refreshing my understanding of this powerful program developed by Jim Kouzes and Barry Posner. Recently, in a session with a group of government executives the big picture came together nicely under pressure. We had too little time to share the gist of the program with executives who were about to receive their 360 LPI (Leadership Profile Index) evaluations. The LPI is the statistical tool that is the umbrella for the TLC program. I say “umbrella” because everyone’s best practices are at the heart of The Leadership Challenge and the 30 behaviors surveyed by the LPI extend to the perimeter of each person’s working territory. Take a look at this 35,000 foot view that I sketched up for the occasion. It’s about 3′ across. At the center our personal bests point to the Five Practices. Each practice carries two commitments and is embodied by six behaviors. It is those 30 behaviors, as they are perceived by the people around the leader, that the LPI measures. The Leadership Challenge emphasizes the frequency of these behaviors as perceived by others. They are the benchmarks for one’s leadership growth. The umbrella extends out to include everyone the leader comes in contact with. 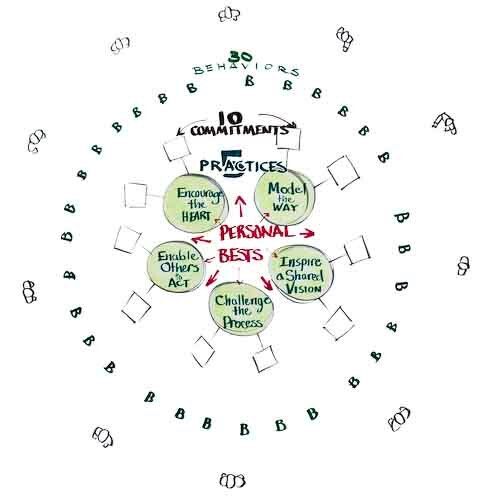 A word about PERSONAL BESTS: If you ask any group of aspiring leaders to share the stories behind their personal bests on the front line, you will hear the the attributes that point to the Five Practices of The Leadership Challenge program. More than 25 years of research continue to support this remarkable core premise that everyone understands what it takes to be a good leader.